Have you been looking for a good detox? I'm always on the search for the best in natural health and that includes detoxing. But with so many detoxes nowadays, how do you know which one to choose? Tea is one of my favorite drinks, so I was excited when Lyfe Tea asked me to do a review on their detox teas. Lyfe Tea is a delicious blend of traditional herbs that aid in digestion and eliminates toxins released from fat cells during weight loss. It's the ultimate way to calm and cleanse your body. Lyfe Tea gives you energy and elevates your mood. This detox tea boots your energy levels without any artificial ingredients as well. Lyfe Tea combines the super-food Moringa with other natural, beneficial ingredients to promote a feeling of fullness and suppress appetite while giving your body extreme nutrition. Lyfe Tea has been featured in publications like E News!, Extra, OK! Magazine, Cosmo, US Weekly, Shape Magzine, Dr. Oz's - The Good Life Magazine and more! Enjoy one cup of Lyfe Tea each morning and one cup of Detox Lyfe Tea every evening to rid your body of toxins. Each package comes with a 14 day supply of their Morning Tea and a 14 day supply of our Detox Tea in loose leaf. Every day I added Stevia sweetleaf to naturally sweeten my teas with an organic lemon squeezed in for extra immunity benefits. Lyfe Tea is a cleanse. The teas effectively clean out your entire digestive tract removing unwanted toxins that may be preventing you from losing weight, making you bloated, preventing you from absorbing all of the nutrients from the food you eat. When your body is full of toxins, you can feel tired, sluggish on a daily basis. The Detox Teas allows your body to rid itself of harmful toxins that may have been building up over time. This aids in excess energy, boosts your metabolism and allows impurities to leave your body. The results are pretty amazing! Check out their before and after pictures here. I absolutely loved trying out the Lyfe Detox Teas. This is one of the best detox systems I've used so far. I had more energy, was noticeably less bloated and noticed a difference within the first few days! I was really surprised at the fast results. They also offer tips and tricks and a 30-day meal and exercise plan you can purchase on their website. I highly recommend you try their detox program and see the results for yourself! 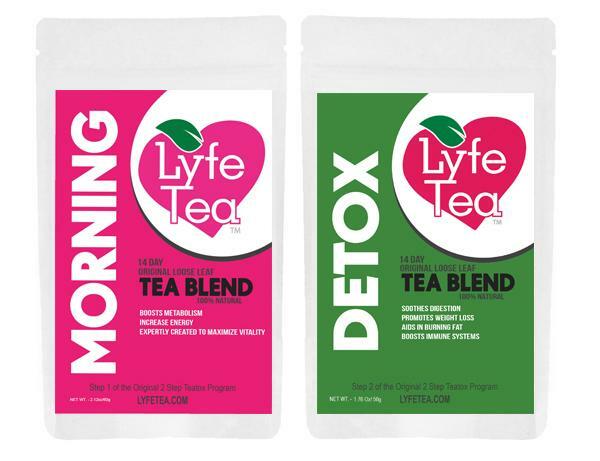 The Lyfe Tea 14-Day Detox is $34.99 one time fee on their website or you can select the auto-ship of $29.71 per month to save money. You can choose a larger tea package on their website. Visit www.lyfetea.com for more info or to get yours!